The coming-of-age film tells the uplifting story of 17-year-old Christine ‘Ladybird’ McPherson, played by accomplished Irish actress Saorise Ronan. Her character is captivating, unapologetic and deep-thinking. Upon changing her name to Ladybird, she declares, “it was given to me, by me.” At first glance, the story is a simple one of an ambitious teenage girl living in Sacramento, California whilst attending a Catholic high school on a scholarship. What is clear from the beginning is the complexity of the relationships woven throughout the conventional, but empathetic narrative. We share in her experiences as Ladybird faces a series of emotional trials and tribulations, which centre around her close-knit circle of friends, family and love interests. A prominent relationship in the film is her first love; a moment most can relate to. Gerwig captures this delicate theme beautifully. Ladybird falls instantly for Danny, a boy in her drama class played by rising star Lucas Hedges. There's a moment after she's shared her first kiss with Danny when Ladybird screams in joy on her suburban street and exhilaration reflects off the screen into the audience. The moment was portrayed so vividly that it could almost be autobiographical on Gerwig’s part; perhaps it is, as she hails from a similar Sacramento background? Interestingly, Gerwig’s depictions of her protagonist’s romances are never the dominating storyline. Men and their complications are not Ladybird’s defining feature; she approaches them with passion, but without consuming her. Ladybird’s relationship with Danny appears at first to be plain sailing. A memorable scene is when they lie in a field at night looking at the stars, cliché I know but somehow Gerwig renders this moment to feel natural, as if you are seeing it for the first time. The collapse of Ladybird’s first love after these blissful moments was depicted with such precision that anyone could imagine it being their own story. She becomes chaotic and frantic, whilst pushing back on cherished relationships as she experiences a perceived breakdown. Each of these moments feels more personal than the next as if my own experiences as a teenage were being conveyed. When discussing the film with a male friend, I was surprised to hear his thoughts that, “I feel as if I had lived through each scene, I know exactly how Ladybird felt.” Perhaps this is why the film is so empowering, heart-warming, because anyone can connect with the characters. A testimony to Gerwig's direction is how natural and comfortable the actors feel alongside one another. Another relationship focused on throughout the film is that of mother and daughter. Ladybird’s impetuous mother is played wonderfully by Laurie Metcalf. The arguments between them are a constant theme, whether in the car, home or the familiar scene in a changing room. The ongoing tension only highlight the characters' need for one other, a need that isn’t admitted until - most unexpectedly - towards the end of the film. Like the audiences' familiarity with first love, most of us can also related to parental frustrations An unforgettable scene plays out when Ladybird opens the car door mid-journey and tumbles out to escape her mother’s relentless nagging. Their scenes together are electric, bouncing off each other’s ridicule like a choreographed dance. The topical subject of female friendship is also represented with respect. Ladybird’s turbulent friendship with her best friend Bernie, played by Julie Steffans, begins with them trusting, nurturing one other whilst going about their daily lives. A whimsical moment when the two have a philosophical discussion on men whilst eating communion wafers feels completely natural. It's only as the film progresses that inevitable complications arise; otherwise it is a gentle depiction of a loving friendship. Perhaps what makes the interconnectedness between each of the characters so real is the writer's ability to depict the characters’ conflicting personalities. 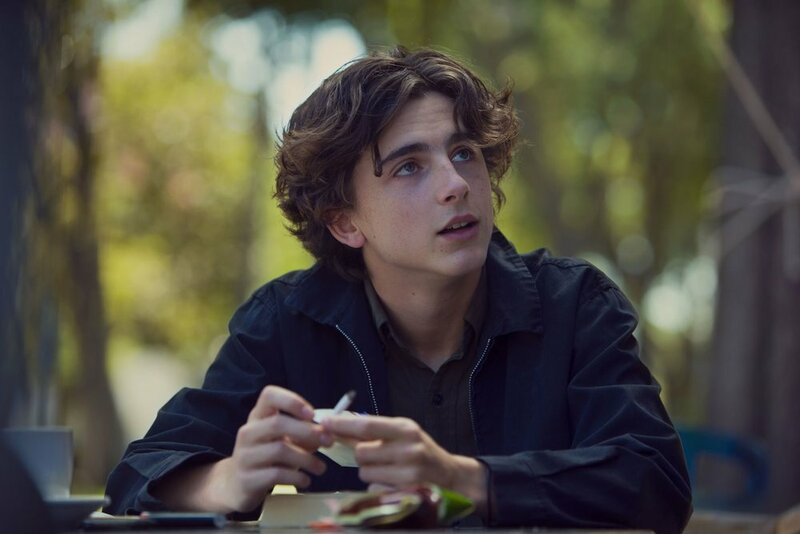 Another rising star Timothée Chalamet’s conjuring of the clichéd, deeply unsuitable heartbreaker is a welcomed addition the narrative. We find him lounging outside coffee shops, draped across cars smoking roll-ups.. need I say more? However, in the end, this film is not only about the people that surround Ladybird, but about finding a sense of place and belonging. Ladybird’s dream was to make it to college in New York, which she did with conviction, but when she arrives she realises how much she yearns for Sacramento and its blue skies, blazing sunsets and she calls home to tell her parents. Perhaps this was how Gerwig felt when she escaped her upbringing? A realisation that she'd taken her life for granted. Maybe Ladybird acts as a commentary on our generation's weakness for instant gratification, thinking the grass is greener somewhere else? This is a thoughtful question Gerwig poses to her audience, but it's also inspirational or motivational in its way. Ladybird escapes her life to do something bigger, something other teenagers - and indeed the audience ourselves - can also aspire to. Ladybird frames itself as a simple concept, but every detail is carefully considered from the noughties costumes to the Sacramento landscapes and economic divide experienced by Ladybird alongisde classmates like Jenna. Gerwig’s vision is thought-provoking, but playful. That's the genius of it.